Logins this hour: 5387 ? 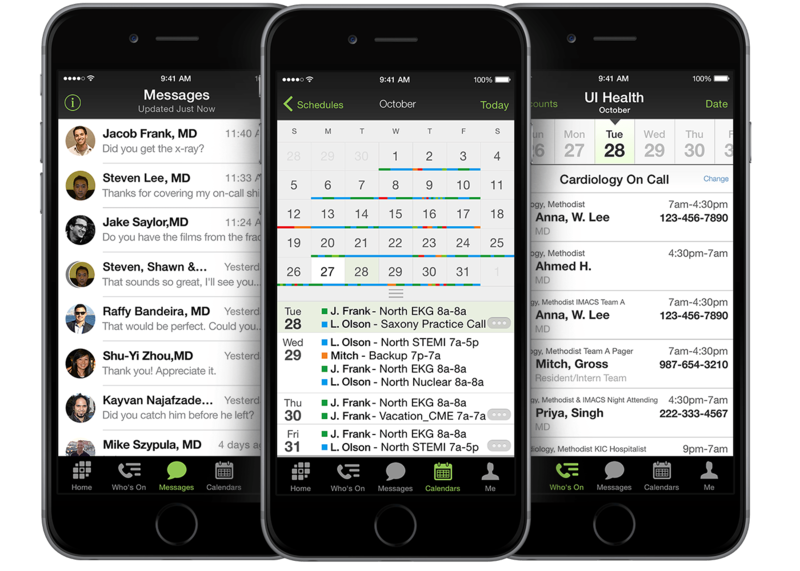 The General Setup is the first step in creating your residency/fellowship schedule in OnCall. You can revisit the General Setup box anytime by selecting File in the menu bar along the top and then General Setup. The General Setup box has tabs along the top where you will enter in your schedule's criteria. You must fill in information for the Services, Staff types, and Staff tabs. Also, the Clinics tab if applicable to your program. 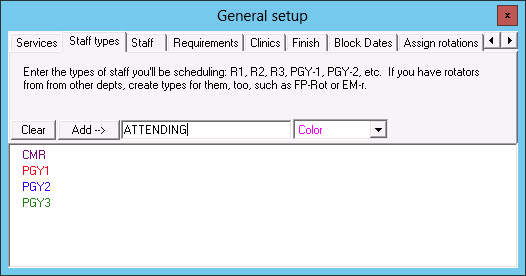 Services, or rotations entered in the General Setup box determine what appears in the Block schedule view. Services can be defined as call, no call, or shift. Call or shift defined services also appear in the Call or Shift schedule views where you can further define them, such as number of staff needed, patterns, and much more. 1. Click on the Services tab. 2. Enter the name of the service or rotation. "Vac" (vacation) is preloaded as a Service. 3. Indicate if the service takes call, no call or shift work by clicking on the drop-down box to the right of the service name. If service takes call, leave Q4 call selected. If service does shift work, select Shift. If service does not take call or shift work, select No call. 4. Click Add or press Enter on your keyboard. The service name will appear in the text box below. Note: If a service name needs to be removed or edited, select the name from the text box. Click "Delete" to remove the name. Or to edit, make the change to the name and click "Rename." You can also change the service type from the drop-down box. These instructions also apply to the other tabs in the General Setup box. Staff Types refers to the type of individual who will be included in the schedule, such as the PGY level of the resident (e.g. PGY1, PGY2, PGY3..), or a general type (e.g. Resident, Intern, Attending..). 1. Click on the Staff types tab. 2. Enter the staff type. 3. Select a color for the staff type. 4. Click Add or press Enter on your keyboard. The staff type will appear in the text box. Staff refers to the individuals who will be included in the schedule. 1. Click on the Staff tab. 2. Enter the staff name. You may enter in last name only, full name, upper case or lower case. Be consistent with how you enter staff names. 3. 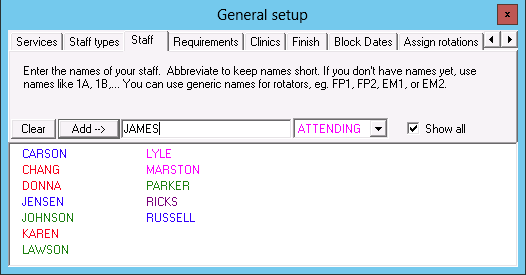 Select the appropriate staff type to the right of the name. 4. Click Add or press Enter on your keyboard. The staff name will appear in the text box below. Clinics refer to continuity clinics residents attend while on their rotations and taking call. 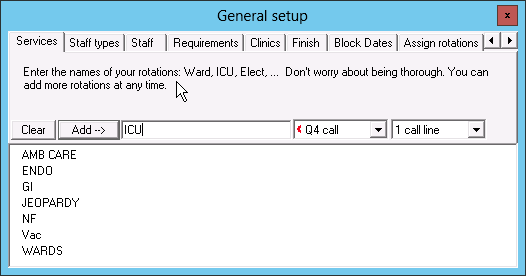 Ambulatory care clinics may also be added in this section or in the Shift schedule view. If your residents do not have a clinic schedule, skip this tab and click on to the Finish tab. 1. Click on the Clinics tab. 2. Enter the clinic name. 3. Click Add or press Enter on your keyboard. 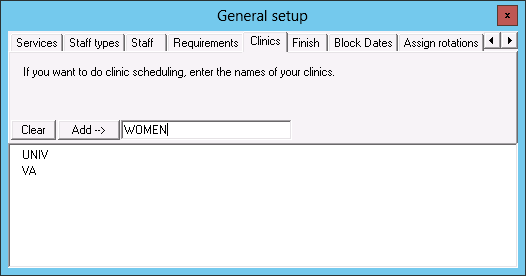 The clinic name will appear in the text box below. The initial setup for the schedule is complete. 1. Click on the Finish tab. 2. Click Go to first block schedule. Entering your Block Schedule is next. You can add, rename or delete information in the General Setup box anytime by locating it under the File menu.